Join us this Sunday at any of our friendly church services. We enjoy welcoming new faces and it would be great to see yours. All of our services focus on being a growing Christian community devoted to maturing in Jesus for the glory of God. 8 am Sunday morning in the St Peter’s Church. A prayer book service with hymns. 9:30 am Sunday morning at St Andrew’s church at Riverside Drive, Airds. 10 am Sunday morning in the St Peter’s Primary School hall. A kid’s program operates during this time. 10 am Sunday morning in the St Peter’s Church. The Macarthur Indigenous Church. 6 pm Sunday evening in the Church Hall. 9:30 am Wednesday mornings in the St Peter’s Church. A prayer book service with hymns. 7 pm on the first Sunday of each month in the St Peter’s Church. Even Song with hymns. St Peter’s Church and Church Hall, 12 Cordeaux Street, Campbelltown. St Andrew’s Church, 1 Riverside Drive, Airds. St Peter’s Primary School Hall, 5 Howe Street, Campbelltown. Jesus said, “This is eternal life: that they know you (God) and the One you have sent (Jesus Christ).” Eternal life, in one sense, begins and continues in the knowledge of God as communicated to us by Jesus Christ. Do you want to get to know the Anglican Church in Campbelltown better? Getting to know the ministry staff, the regular events that occur in and around the church and the main objective or mission of the church is a great place to start. Whether you are new to the faith or simply new to this church, this is an excellent place to begin. ‘O Board’ is usually an evening event that runs several times throughout the year. Held in the church hall, supper is provided and some great information about the church and how to connect well within it. If you feel newish to this church and want to feel more a part of the community, start here. 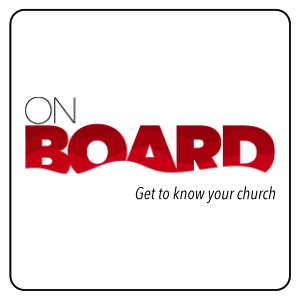 To find out when the next ‘On Board’ event is held and for more information, click here. Do you want to discover what Jesus really said and did? 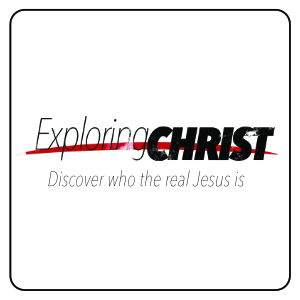 ‘Exploring Christ’ is a really special course that takes participants right back to the events of Jesus’ life. There are four sessions which go for about 90 minutes each. Usually these are run on a Sunday afternoon but occasionally are held on week nights. The course emphasises knowing the true God through the way he has communicated to us. For more information and to find out when the next course is being run, click here. Do you want to move forward in your faith? Following Jesus as your Lord and Saviour is what life is all about! 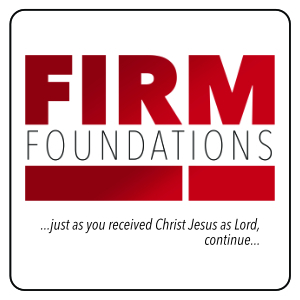 ‘Firm Foundations’ is an eight week exploration for opening up several life changing things about being a disciple of Christ. This course is for new and old Christians alike. It unpacks eight amazing things that every Christian ought to know in order to start living and growing in Christ. Find out more here. Do you want to join a Growth Group and grow in maturity together with other Christians? It makes sense. The bible not only loves community, it endorses and assumes that Christians will meet together in order to build one another up in the faith. Sure, Sunday services do this but meeting in smaller groups provides stronger relationships which are caring and perfect for coaching one another in walking faithfully with the LORD. It is all about coaching and caring. Growth Groups meet in homes and church meeting rooms throughout the week to pray together, read the bible and discuss how to live out and grow stronger in the Christian faith. 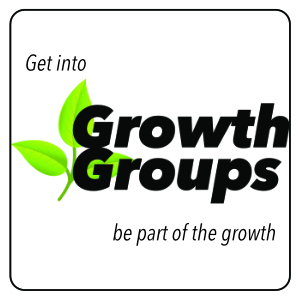 Find out more about Growth Groups here. We have a vibrant program for young people in our community. 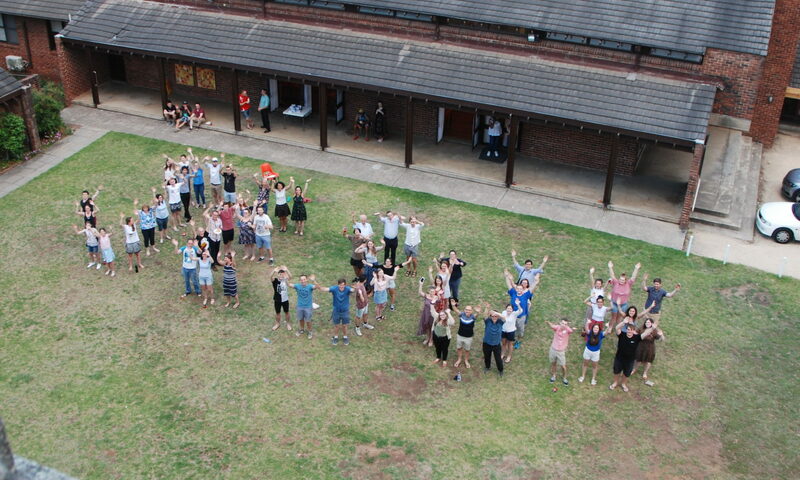 Our goal is to share the good news of the gospel with young people in and around Campbelltown. Here is a short list of our key youth and children’s activities. Fr iday Night Youth is run during term times in our church hall. 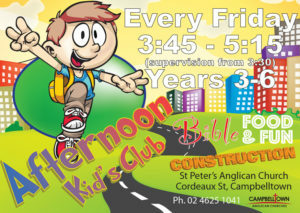 Arvo Kid’s Club is run on a Friday afternoon during school term times. Creche, PK’s, Kid’s Church and 56’s are all run during our 10am Sunday service. Click here for information on Safe Ministry procedures at Campbelltown Anglican Church. 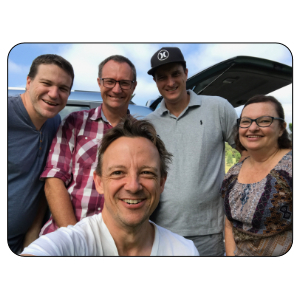 We are an Anglican Church in the Macarthur area, south-west of Sydney, striving to be a growing Christian community devoted to maturing in Jesus for the glory of God. The church building has been around since 1823 but the message we preach goes back to the same taught by Jesus to his disciples.